Rachel and Thomas comment: In the book, the cover girl struggles with anxiety, depression, an estranged family, substance abuse, an eating disorder, self-harming, fits of violence, illiteracy, poor self-esteem, and the titular lycanthropy. It is just plain cruel to make her poorly drawn as well. Anxiety sounds a bit mild for a werewolf. I suggest the disgruntlement or the inconvenience. Of flyaway hair. Wrong! Your kid is much more talented than that! How dare you undermine your child’s self-esteem! Huh, Martin’s a good writer and both North American and British publishers are subsidiaries of pretty significant independents (Perseus and Little Brown). The book’s content has me intrigued but you have to say that this cover deviates wildly from the feel of the UK’s Piaktus cover art. Also his Twitter feed tells us that he plays games of the video variety and should probably join our secret Steam group. Wow, looking at the Piaktus cover art makes this one look like crap. Why didn’t the publisher use the Piaktus cover in the US as well? You know, if it hadn’t been for the fact this girl’s a werewolf, I would have assumed I was on Awful Library Books and it was Teen Week or something. Dang I would stay in werewolf form all the time, turning into Courtney Love above is WAY worse! Being killed by a lycanthrope is a fate worse than death. A fate that is worse than a fate worse than death would be to be killed by an emo lycanthrope. A fate that would be worse than a fate worse than a fate worse than death would be to get killed by a poorly drawn emo lycanthrope. I’d imagine this going over quite well with the goth crowd though. The only thing sadder than severe depression and mental illness is cursed and hellborn severe depression and mental illness. 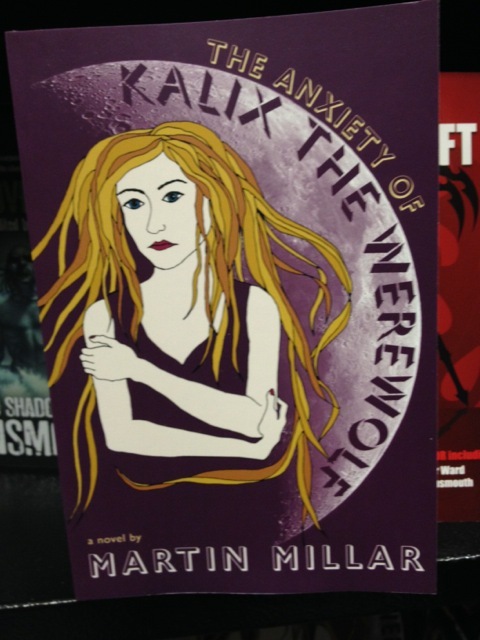 Is this a comic book put out by Pfizer to market Z-o-l-o-f-t to teen werewolves? @GSS Admin — when I typed Z-o-l-o-f-t without hyphens I got a FORBIDDEN screen and my comment would not go through. Do you realize you have server problems? Does the long hair go along for the ride when she weres? @Bibliomancer — on our website it is forbidden to post comments without a reference to a popular prescription drug. ‘Soft Skull Press’. If you press a soft skull it gets messy. The edition that Tag Wizard links us to tells us to “Meet Kalix MacRinnalchâ€”she’s a werewolf with attitude . . .” I dunno, is that so special? I mean, have you ever met a werewolf that didn’t have “attitude”? Seems unavoidable, what with the hair and claws and moon and such. That’s probably why Z-o-l-o-f-t is such a big part of the werewolf underground club scene. I can’t shake the feeling that I’ve seen that image somewhere before, possibly in a collection of 90’s vector clipart. Goodness knows the lycanthropy-as-puberty-analogy has been done just a couple of times. @Bibliomancer – We’re sorry! And that’s just the type of drug we’d want with all these server problems we’ve been having! Clearly this is meant to be the heroine’s self-portrait on deviantArt. The GSS commenting restrictions could present problems for the inevitable post on my upcoming pulp sci-fi novel (NOW IN PAPER BACK FOR THE FIRST TIME!). In this thrill-packed joyride, our hero L-E-V-I-T-R-A must escape the brutal legions of X-A-N-A-X before they destroy his home world of L-I-P-I-T-O-R by kidnapping the warlord’s beautiful daughter V-I-A-G-R-A! But when he starts to fall for her, will she sell him out to the cannibalistic Z-O-C-O-R? I’ve missed you all, and we’ll never be parted again – never! Ha ha! Never do you hear me – Never! EDIT – Sorry I should of said, when it breaks again! Actually, you should have said ‘should have said, when it breaks again’. @Tat Wood:Good catch! An educated person communicating in their native tongue wouldn’t make such a slip. However, an imposter whose first languageis , say, Cantonese might. Is this really our GSS? Or are we also victims of the Chinese military’s hhacking campaign? DonÂ´t miss the other exciting installments in this series! @RachelJ: That could very well be… Although thereÂ´s a profound lack of smoke related adversaries on this particular cover. How’s she doing that with her right wrist? I could have drawn this. If someone had asked me to, and I worked really hard on it for a week, I would have ended up with something that looks like this. Which is to say it is awful. Does anyone else find the new Stormtrooper helmets ‘meh’? @Dead Stuff With Big Teeth. When it happens in a chain of comments do they still call it an anacoluthon? Also, please specify who has changed their helmets. Stoßtruppe (German Realm during WWI), misunderstood loyal lackeys in current science fiction movie franchise, or obscure reference to American Civil War, Paraguayan War, Arditi, Red Army, or Yugoslav Partisans? @DSWBT: Well, IMO the fake dreadlocks aren’t what the Stormtroopers should be about. Her hair looks like it’s made of clay. Reminds me of an art project I did in elementary school. Face of the typical American 20-year-old on Election Day.